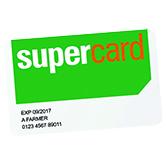 As a Farm Source account holder you can access many benefits including the SuperCard, Farm Cover and a range of farm and home utility offers from leading energy, telecommunications and construction partners. SuperCard gives you access to great deals at more than 2000 retailers across the country. Purchases are charged to your Farm Source account so you enjoy the convenience of one monthly bill plus up to 50 days interest free. Available exclusively to Farm Source account holders, Farm Cover offers specialist insurance policies for both dairy and drystock farming operations. Our fuel partners offer reliable on-farm fuel deliveries nationwide as well as saving up to 16 cents per litre on fuel with your Fuel Cards at Caltex, Z Energy, Mobil and BP. Energy partners Meridian Energy and Mercury Energy have energy plans designed to support your business needs. Great discounts available. Our telecommunication partners Spark, Vodafone and Farmside have special pricing plans available for your landline, mobile and internet connections.